The Samsung Galaxy S4 is about the same size and weight as the Galaxy S III, except that the new model is slightly thinner. Even so, the battery capacity has increased by 500mAh to a nicely sounding 2,600mAh total. Still, that battery has to feed four Krait 300 cores and a bigger screen with over twice the number of pixels. Let’s see how the 2013 flagship from Samsung compares to the one from 2012. Before we continue, we should make it clear that we’re using the I9505 for this test, that’s the Snapdragon 600 chipset and not the Exynos 5 Octa. The first test – the call test – has the screen off and the processor idle, so most of the time it comes down to battery capacity. 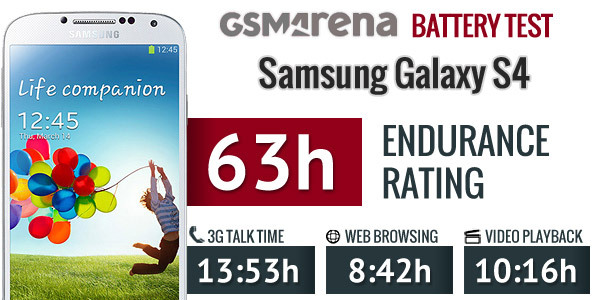 As expected, the Samsung Galaxy S4 beats the Galaxy S III here, with a healthy margin of 3 and a half hours. Still, the Sony Xperia Z with a slightly older Snapdragon and smaller battery (2,300mAh) managed two hours more. The Galaxy S4 posted an impressive time in the web browsing test, the usual Achilles heel of AMOLED-based phones. It outlasted an Android 4.1.2-running Galaxy S III by just over two hours.The HTC One managed an hour more with a smaller battery (2,330mAh), but the slightly smaller LCD sure helped. Video playback is typically a strong suit for AMOLED screens, but the Galaxy S4 doesn’t really improve much over the Galaxy S III. Still, for a 5” 1080p screen that offers brilliant colors and contrast, over 10 hours is a pretty impressive score. 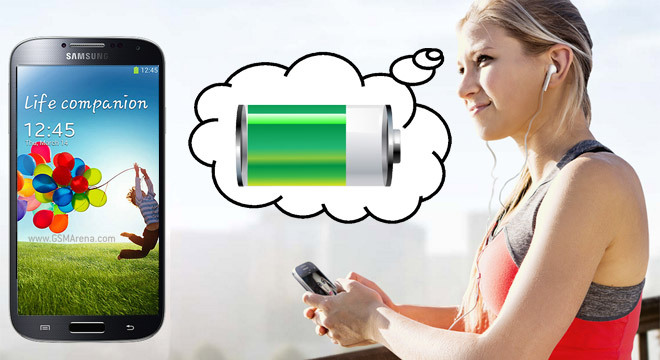 The Samsung Galaxy S4 is a good performer in the individual categories and thanks to efficient standby, it scored a very respectable endurance rating of 63 hours. That’s how long it will last between charges if you do an hour each of calling, web browsing and watching videos every day. You can learn more about how we do the batter test here. The Samsung Galaxy S4 should get even the heaviest users through a single day, while most can expect two, three work days out of it. The battery life is pretty well balanced, with the Galaxy S4 getting near the top of the chart in every test, so it doesn’t matter if your personal usage patterns involve more talking or more web browsing, the Samsung flagship has excellent battery life. While we’re here, we should mention that Samsung will be selling accessories for the Galaxy S4 to help with the battery life – one is a special back cover that enables wireless charging and the other is a dedicated charger for a second battery.